In today’s competitive environment, business executives need timely and accurate historical financial data and rational forward-looking information in order to make sound business decisions. Cordia Partners is able to support all of your requirements in the finance and accounting function from transaction processing, financial reporting and forecasting to more strategic CFO and Controllership advisory services. We view ourselves as your internal finance and accounting department, and we are always looking for ways to leverage proven technologies to streamline and improve the efficiency of our services while maintaining and effective system of internal controls. Besides saving your company precious time, labor and money by outsourcing key business and financial services to our firm, you’ll also be able to redirect your internal staff and resources to supporting higher-value, revenue-generating core business functions. We will provide experienced accounting and financial management talent to manage your critical business processes more efficiently. We will provide high-value business advisory services including CFO and Controllership services, as needed to support your growth. You won’t have to worry about software and hardware upgrades or maintenance of your accounting applications. Our cloud technology platforms are state-of-the-art and offer the highest levels of security in the industry. Your financial data and business information is always safe, secure and accurate. 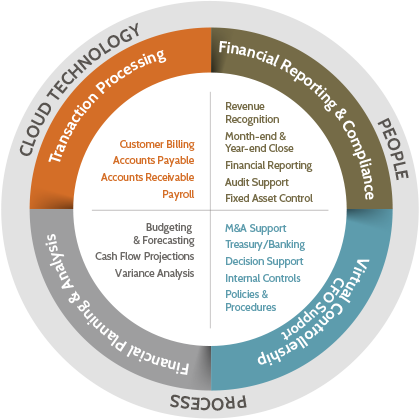 Cordia Partners offers a full range of technology solutions that enable our professional staff to deploy and manage effective and efficient accounting processes that are adaptable to the changing needs of your organization. By leveraging best-in-class technology solutions Cordia is able to bring industry best practices to small and mid-market companies that would otherwise not have the time or resources to stay current with the latest technologies, and the evolving accounting practices they enable. For our clients this means that management is able to focus more of its attention on the growth and development of core operations while having access to talents and expertise required to achieve your strategic goals. Regardless of whether your organization is large or small, or has experienced downsizing or rapid growth, your accounting function has likely faced some very common challenges such as high turnover, staff performing tasks above or below their skill level, or entrenched and outdated processes. 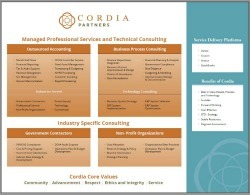 Cordia Partners has designed standard processes and methodologies utilizing best-in-class technology solutions that enable our staff to deliver high quality, cost effective accounting services to the industries we serve: government contractors, non-profit organizations and commercial service organizations. Growing companies require the expertise of talented financial professionals to advise management and ownership on a variety of financial issues ranging from risk management and technical accounting guidance to emerging technologies that may improve efficiency and strengthen internal controls. The roles of CFO and Controller can be interchangeable depending on your size and complexity of business operations. These factors will influence the skills required and level of effort needed to support the continued growth of your business operations. For small and mid-market companies, Cordia Partners team of experienced CFOs and Controllers provide industry specific expertise without the cost of hiring a full time employee. Learn more about how non-profits, government contractors and commercial businesses rely on Cordia for their outsourced accounting needs.